Well. You have been warned. I've been itching to wear a bow tie since seeing "Coco Avant Chanel" and while I look no where near as adorable as Audrey Tautou, I'm still pleased with the end result. Except for the part when I took off my blazer and my boyfriend told me I looked like a waitress. That part I was not pleased with. Ahem. Ian. But today is said boyfriend's birthday, so I'll let it slide. Just this once. i think you look cute. :) preppy looks good on you! the velvet skirt is so cool. love it. love it. very cute - I'm always worried about looking like a waitress whenever I wear a tie or bow tie! 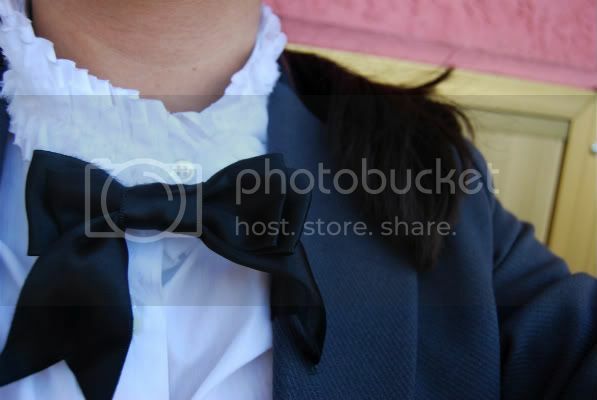 Love the ruffled shirt and what a great cheap way to make a bowtie! Hee hee! That cute little bow tie has me tickled pink! You look pretty.. that bow tie is just so cute..
Krystal, this is just darling. I love everything about it. The bow is so cute!!! you have the sweetest hair in the world! and i love your outfit. in my book, bows are always in! I love this outfit! The bow tie is adorable! I bought a bow tie in gray Chambray from American Apparel a few weeks ago and have not worn it yet. I just knew I loved it and Usually buy on that basis and figure it out later. The way you have done it is so cute. Gives me the inspiration to give it a whirl. Thanks! girl, i love it! i really want to try wearing a bow tie, too! I love the bow! You've totally inspired me! so cute + preppy! i love the bow and jacket. i have yet to find the perfect boyfriend blazer. I love your outfit ! Especially this adorable little bow tie ! I love the little bow! I might have to steal that idea sometime- I think I even have that same little bow from walmart. What a sweet outfit, very Gossip Girl! Love that blazer! You are making me want to wear a bowtie too! I think you look so cute. my fav outfit by far! So darling! Great styling! Cute outfit. I love the bow! haha. my boyfriend often has an unwelcome commentary, don't sweat it. i love the bowtie, you rock it well!